With the help of some research accumulated in Part 1, we were able to describe some astonishing features of bamboo, a natural composite material. You can learn several other interesting attributes of bamboo through the American Bamboo Society and Bamboo Web. Bamboo also comes with a fair share of disadvantages. 1.Bamboo contains about 2-6% starch, 2% deoxidized saccharide, 2-4% fat, and 0.8-6% protein.The carbohydrate content of bamboo plays an important role in its durability and service life. Durability of bamboo against mold, fungal and borers attack is strongly associatedwith its chemical composition. Bamboo is known to be susceptible to fungal and insect attack. 2. Bamboo needs to be preserved like timber; the natural durability is less than that of timber. 3. The fire risk is higher for bamboo than for timber. 4. Since bamboo culms (stalk) are a product of natural growth, no two culms are alike. This makes it more difficult to realize joints. Also more effort is needed to establish prefabrication and industrialisation. Even more than for timber products. 5. It also seems to split and crush easily but this may vary with the age and variety of the bamboo. I'm not sure. 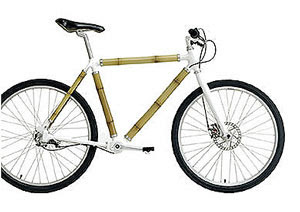 Now several parties have investigated and applied bamboo to bicycles. Some are well known, while there could be others that Google search algorithms cannot get a hold of. 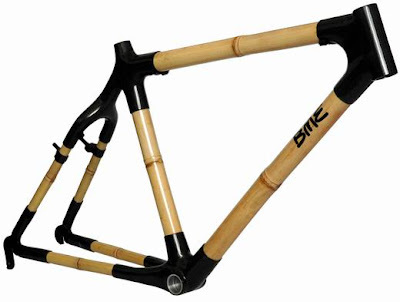 Calfee, a name synonymous with carbon fiber, is also ridiculously famous for its venture into using bamboo as a frame material for bicycles. An interesting fact is that he got the idea while seeing his dog Luna chew on a piece of bamboo outside his shop in Santa Cruz. 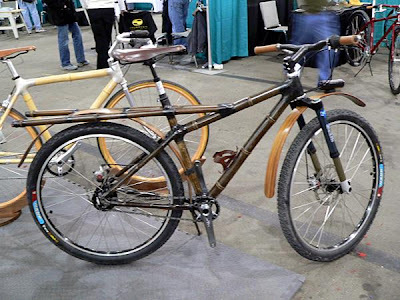 He got into thinking that if bamboo could resist the jaws of his dog, it might just be sturdy enough for a bicycle frame! Typical Issac Newton scenario. Or sort of. 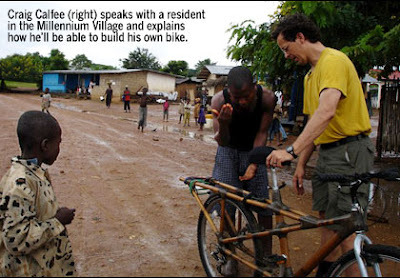 That very idea, combined with the support and financial backing from the Earth Insitute of Columbia University, led him to Ghana, intent on making bamboo bicycles for the poor for a sustainable and cheap means of transportation. The promise of a locally built bamboo bicycle facility as a substitute for steel shortage in Africa was inviting as the primary idea itself. 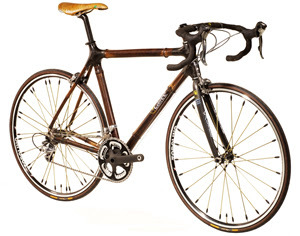 Ironically, his very leadership and talent in making low cost bamboo bicycles for Africa has also led him to make a commerical racing version of a road bike that looks pretty handsome, but stands tall in costs at almost 3000 dollars (just the frame I think). Its called Luna. A here's a nice video showing the frame up close. Brano Mares, a talented Mechanical Engineer from Slovakia gained his motivation for working with bamboo from Calfee himself. 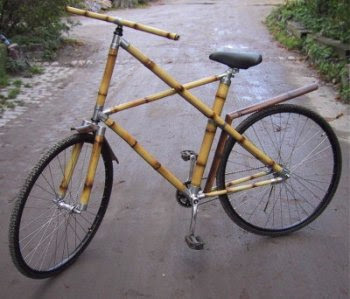 He has also shown us some sweet bicycles made of bamboo. In his articles, he goes through the process of building them and is very open about bamboo's strengths and pitfalls. It'll be a good read. 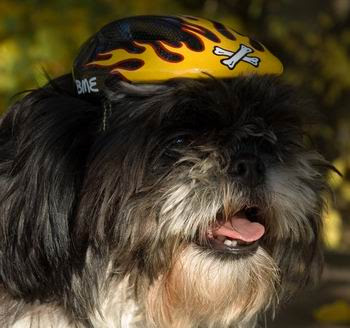 Brano also has a dog, like Calfee, but this one is more bike enthusiastic! Biomega have also played a little with bamboo, coming up not only with the natural material for the frame but also a clean, internally geared rear hub. They call it Biolove Bamboo. 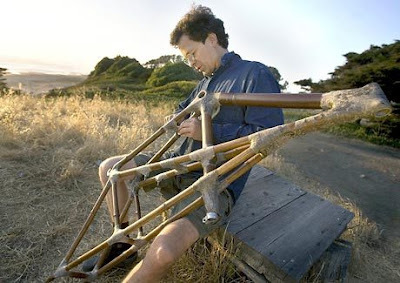 Flavio Deslandes, a Brazilian Industrial designer once made a bike out of bamboo but after that, he apparently disappeared off the radar. His website just shows his name and no bicycles. Does anyone have his whereabouts?? 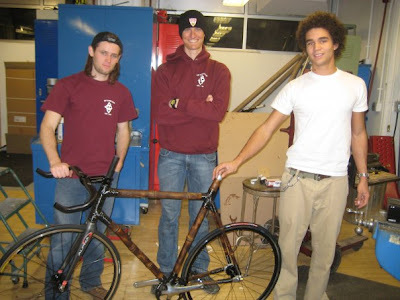 Nick Frey, a talented time trialist and engineering student at Princeton, and his team have also come up with a bamboo bicycle in the form of a fixed gear prototype called Model Zero. Their work sounded very much like a design project at school. He details the process of production on his blog. "The most common question is, "Why bamboo?" The answer is pretty simple: 1) it is unique, 2) it is very stiff because it is a natural composite, and 3) its stiffness belies its amazing ride quality due to the fact that bamboo dampens 4 times more vibrations than even carbon fiber. A racer usually must choose light, stiff, or comfortable--with this bike, you can have all three." Nick and his team think they can start a company to focus on bamboo bicycles. They are thinking about a pricepoint of 1200 to 2400 dollars on a stock frame to full custom frame respectively. I caught up with Nick over the past week to ask some questions on the frame. Me : How are you making it fire and insect proof? Nick : We heat-treat it with a propane torch (just found a new technique so the sugars burn and mottle the tubing--BEAUTIFUL!) and then bake it for 8 hours at 250 degrees in an oven. 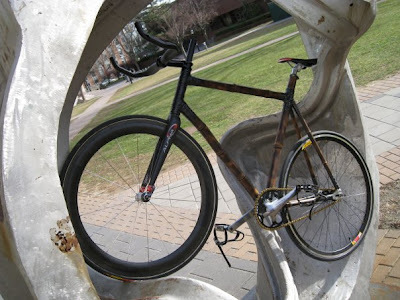 Once the bike is built, tung oil is applied to give it a clear finish and seal it, but the bamboo can still breathe so that humidity changes and rain are not an issue. Insects go for sugar, so if there is no sugar, then no insects. Me : What wall thickness are you looking at for preventing splitting and damage? Nick : The wall thickness varies from tube to tube and from bike to bike, depending on the rider's weight and riding style. The tube thickness also varies along the length of each tube! The nodal density is an important factor in strength and weight as well. We have made the downtube, seattube, and chainstays quite thick (i.e. around 5mm) and larger diameter (40mm), as well as making the thick-end of the tubes come together at the BB shell, because those tubes are the highest-stress points in the frame. Then the seatstays are quite thin and light, and the top tube is thin and smaller diameter as well so your knees don't hit it (think Cervelo aluminum bikes). The process of selecting each tube and treating it by hand is really cool, because each bike is not only unique, it is perfectly optimized by nature and by us to ride a specific way. 1. So was this master plan part of a senior project or just time pass..? Where did the idea to form a company pop up from? 2. The propane torching for the bamboo is totally new? I mean, are you looking to patent it? That'd be cool. Whats cutting tools do you use for bamboo (just saws?) and are you also employing any jigs for torching, assembly etc? 3. Who supplied you with the oven and bamboo raw material for initial pilot project? 6. Lastly, how do you ensure straightness in your tubes? Bamboo is all natural. Model Zero's down tube has a little angle 1/4th of the way from head tube (at least looks to me). I suppose you'll selectively pick your tubing then ? Hey Nick, you can throw me an email or leave a comment here should you wish to answer. 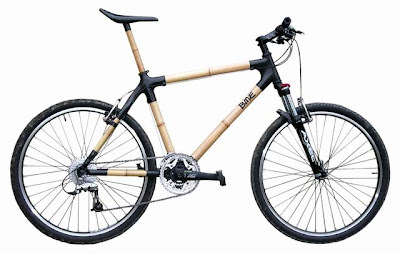 In conclusion, this is very interesting news (at least to me) as companies that make bamboo bicycles are very few in number and we still haven't seen a significant mainstream production. There has to be some competition in the market if we're to see better production technology, new designs and economical costs. On one side, bamboo competes with steel in properties and easily rivals glass fiber composites. People who have ridden the bike attribute great vibration dampening characteristics. The other issues are the obvious challenges of working with Bamboo. Several desired properties seem to be a characteristic of bamboo variety and age. Furthermore, to build bamboo bicycles, one needs to ensure roundness of tubes and consistency of joints. Selection of raw materials seem to be an issue and I don't know how many quality suppliers exist to provide bicycle tubing. And finally, will people gain confidence in bamboo for riding and racing and will there be a buying shift from conventional materials and carbon composites? Bamboo is interesting, but what I find more interesting is people reverting to this material after centuries of usage. It just goes on to show the immediacy of the need for efficient, cleaner, greener, and cheaper materials that do the same but at the same time are more forgiving to the earth we inhabit. Just plain cool... great to see such pioneers. Does anyone know of a good specialty metals company that can produce custom made metal parts? 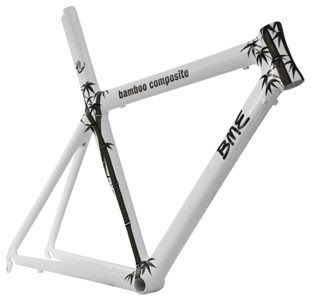 Hey , check out Evolve Bicycles , a Bamboo Bike frame manufacturer from Canada. You may already have discovered this, but in answer to your question about Flavio, he's listed as a contributor on the Biomega site that you link to in your article.